So many of our dreams at first seem impossible, then they seem improbable, and then, when we summon the will, they soon become inevitable. If we can conquer outer space, we can conquer inner space, too. Christopher Reeve has mastered the art of turning the impossible into the inevitable. In Nothing Is Impossible, he shows that we are all capable of overcoming seemingly insurmountable hardships. He interweaves anecdotes from his own life with excerpts from speeches and interviews he’s given. Reeve teaches us that for able-bodied people, paralysis is a choice — a choice to live with self-doubt and a fear of taking risks — and that is not an acceptable one. Reeve knows from experience that the work of conquering inner space is hard and that it requires some suffering — after all, nothing worth having is easy to get. He asks challenging questions about why it seems so difficult — if not impossible — for us to work together as a society. He steers the listener gently, offering his reflections and guidance but not the pat answers that often characterize inspirational works. 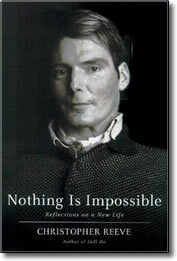 Published on the eve of both his fiftieth birthday and the seventh anniversary of his spinal cord injury, Christopher Reeve’s Nothing Is Impossible reminds us that life is not to be taken for granted but to be lived fully with zeal, curiosity, and gratitude. That is a powerful message in itself, but it is the messenger who gives it its full resonance.